"was an American author of novels and short stories, whose works are the paradigm writings of the Jazz Age, a term he coined himself. He is widely regarded[by whom?] as one of the greatest American writers of the 20th century. 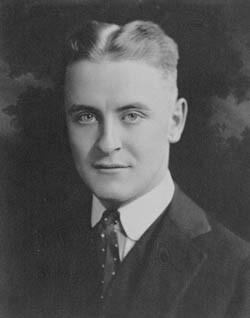 Fitzgerald is considered a member of the "Lost Generation" of the 1920s. He finished four novels, This Side of Paradise, The Beautiful and Damned, Tender Is the Night and his most famous, the celebrated classic, The Great Gatsby. A fifth, unfinished novel, The Love of the Last Tycoon was published posthumously. Fitzgerald also wrote many short stories that treat themes of youth and promise along with despair and age. His novels such as The Great Gatsby and Tender is the Night was turned into movies and in 1958 his life from 1937-1940 was picturized in the film Beloved Infidel." "We now have an all-new version of this post, updated for the new movie with teaching ideas as well as both the resources below and many new ones. Find it here." "THE GREAT GATSBY by F. Scott Fitzgerald portrays the life of the wealthy during the Jazz Age (the Roaring Twenties). The 1920s era evokes images of flappers, racoon coats, the Charleston, and Prohibition. These images, however, reflect only a small part of life in this decade. What was life in the 1920's really like? On what people, events, and activities does Fitzgerald base THE GREAT GATSBY? In order to get the most out of the novel, you need to understand the culture of that era. Therefore, your job is to prepare a "special limited edition" guidebook, make a Power Point presentation, or write a documented research paper describing life in the '20's as it really was." The Great Gatsby "is a 2013 Australian 3D romantic drama film. An adaptation of F. Scott Fitzgerald's 1925 novel of the same name, the film was co-written and directed by Baz Luhrmann, and stars Leonardo DiCaprio.. It follows the life and times of millionaire Jay Gatsby and his neighbor Nick, who recounts his encounter with Gatsby at the height of the Roaring Twenties..."
See also other film adaptations.